Aloha! I am Makahele Koa Alaia. In a former life, I was a majestic Koa tree, born and raised in the I’o Valley on the island of Maui. But now, I have been reincarnated as an alaia, for it was my destiny. Koa has always been prized for its reddish-brown, fine-textured wood. Carpenters and craftsmen alike have always been attracted to its low shrinkage, workability, and unique ability to cure from green wood to finished product without cracking. It provided the early Hawaiians with a stable wood from which to build houses, canoes, and most importantly for the sake of you readers, surfboards. You see, in Ancient Hawaii, surfing–or he’e nalu–was of great spiritual magnitude. Everything from praying for waves to the art of making boards was ritualistic. The board you rode and even the wood in which it was constructed determined your place in the society’s pecking order. Under the kapu system of laws, the ali’i, or ruling class, was above all others. The commoners surfed on paipos or alaias made of ula or koa wood, and the ruling class rode another type of board made of the more buoyant wili wili wood, called an olo. I, personally, am proud being the wood of the commoner. E ola koa! While I was born in the I’o Valley, I’m not actually quite sure of my birth date. All I know is that Koa trees may be the most ancient tree species in the Hawaiian archipelago. Scientists believe that as a species koa is millions of years old. I do know that in February of 1911 my life as a tree came to an end. That month I was harvested by a ship’s captain (and surfer), and shipped all the way to North Florida where I was to become part of a house to be built on the St. John’s River. That house, however, was never built, so I’ve spent the past 99 years as a plank, 6 feet 11 inches tall, 16 inches wide and one inch thick, sitting in a barn with hundreds of other Koa planks. 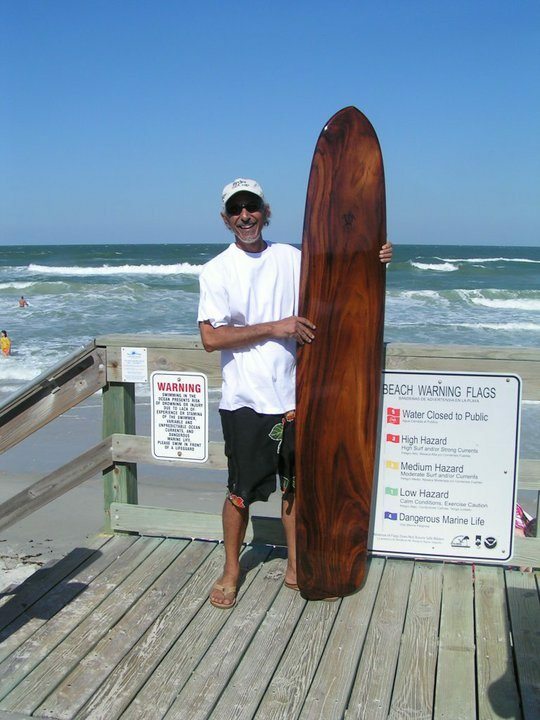 About three years ago, a surfboard shaper named Greg Hall, was contacted by a group of lawyers and informed that he was the recipient of myself and all of my other Koa plank friends, willed to him by the dying ship’s captain. One, he was to never divulge the name of the family or the location of the wood. Two, he was not to pay for any of it. Three, he could use all he wanted. And four, he could use it only to build surfboards. When Marion Stratford, a surf writer from Jacksonville Beach, Florida, heard this story he was, to say the least, blown away. He told the story here on The Surfing Handbook, and in the following days got to know Greg better. As the stories unfolded there was one thing for certain: He had to have one of the magnificent alaias that Greg was building. Marion promptly placed his order for an original Koa Alaia. Characteristics: Very dense, high lignin content. Arcacia Koa, some checks (cracks I will fill). Cathedral grain pattern, black stripes therein. Flitch was wrapped and inscribed with the word MAKAHELE. Princess Ka’iulani “was an expert surfrider,” according to early Twentieth Century surfrider Knute Cottrell. So with my new life came a new name: Makahele. Greg decided to shape me from a template of an alaia owned and ridden by Princess Ka’iulani from 1889. 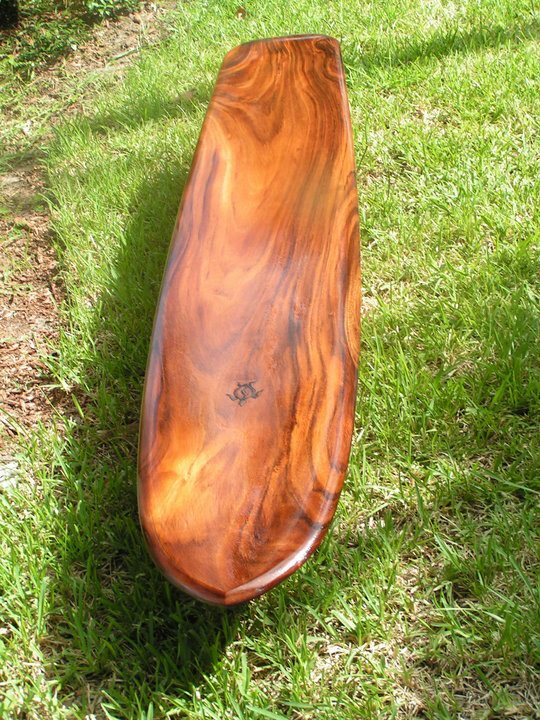 Princess Ka’iulani’s Alaia is one of, if not THE oldest surfboard still in existence. It has been housed at the Bishop Museum in Honolulu since 1922; part of the estate donated by Ka`iulani’s father Archibald Cleghorn. Born Victoria Ka’iulani Kalaninuiahilapalapa Kawekiu i Lunalilo Cleghorn in 1875, Ka’iulani was heir to the throne of the Kingdom of Hawai’i and held the title of crown princess. She became known throughout the world for her intelligence, beauty and determination. After the overthrow of the Hawaiian monarchy in 1893 she spearheaded a campaign to restore the Kingdom, but her negotiations could not prevent the eventual annexation. And, oh yeah, she was a surfer. Needless to say, I am honored to carry on the tradition of such a great princess. That’s what I really like about Greg: He’s not only a gifted shaper, but he carries within himself the Aloha Spirit, acquired during his 26 year tenure shaping boards and riding big waves on the North Shore. He always handles me with care and uses only hand tools, just like the Ancient Hawaiians 1000 years ago. He even took the time to have me blessed, as is the Hawaiian tradition. Quite flattering, I must say. But I must admit… I do look pretty good, don’t I? Gotta admit...I am looking good, aren't I? So, having been blessed by the Duke and the Tiki, I looked forward to being branded with Greg’s honu petroglyph, the logo for his Petroglyph Surfboards. Marion arranged to drive down to Altamont Springs, but then Greg had another idea. It turns out that Greg was attending the 10th Annual Beach Bash at Bethune Beach on October 3. It was decided that Marion would drive down to the bash and pick me up that Sunday. And so it was. Greg and I drove to Bethune Beach and met Marion, who I must say, sure does grin a lot! I don’t know if it was me, or the alcohol, or what, but he wore a smile that never left his face the entire day. In fact, he’s still smiling. Delivery to Marion on October 3, 2010. I told you he grins a lot! Today, I am standing in Marion’s living room. The house is sweet with the delightful scent of tung oil, and I’m fond of the new crib. I miss Greg, but at least he sold me to a surfer who is aware of and appreciates my humble beginnings and the lives I have led thus far. I’m certain we will have a wonderful life together. Marion has lots of friends who all tend to admire me, offering “oohs” and “aahs” as they fondle me from nose to tail. They speak of my hard rails and beautiful grain, and quite honestly, it can get to one’s head a bit (but just a little)! However, that being said, I’ve got to tell you, after one week, I’m starting to get a little agitated. After spending the past 99 years in an old, moldy barn, I’m not exactly diggin’ leaning against Marion’s living room wall. I’m a beautiful Koa Alaia. I bear the name Makahele. I was born in the I’o Valley, site of Battle of Kepaniwai and inspired by the great Princess Ka’iulani! Darn it! I am destined to surf… and I wanna get wet! Marion Stratford is a freelance writer from Jacksonville Beach, Florida. A surfer for 45 years, he has covered surfing as a correspondent for the Florida Times-Union and is currently a National Surfing Examiner with Examiner.com. awesome! I am going to make alaia too! what kind of bottom did you created? flat with sharp edges or concave? Mahalo Stuart! Unfortunately, the surf has been flat for the past two weeks. We’ve been praying for off-shore winds here, and we finally got ’em, but now the surf is all blown out! As soon as we get some sort of swell, Makahele and I will “be as one with the wave.” For now, she’s still pissed off leaning against my living room wall! What a cool story and what a spectacular board. Man I am inspired by that. Thank you. Any news on how she surfs? Gregory! Shame on you using Makahale to try and hawk your boards! Personally, I hope you sell a million of them! Please visit my blog and facebook page!